Reno is called the “Gateway” to Burning Man. The Burning Man event, held annually in the Black Rock Desert north of Reno, is the world’s largest venue for interactive art installations. For seven days, people come from all over the world to share their vision of playful creativity. 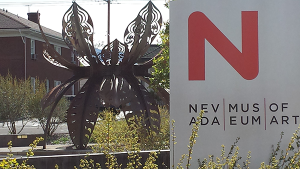 We, as a community, are very fortunate to have so many well-known, national and international, artists visit our city. The beauty and majesty of the high desert captures hearts on a daily basis, even luring some to call it their permanent home. 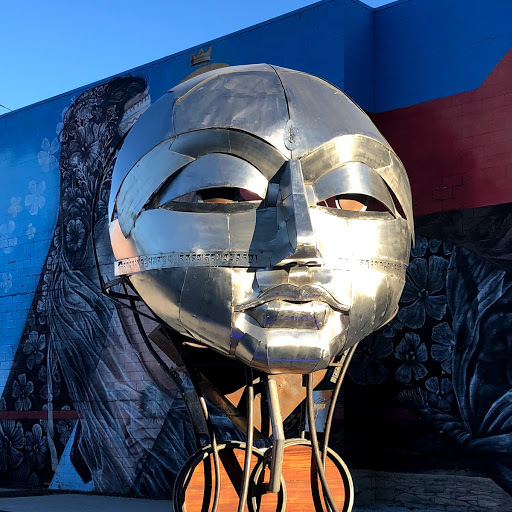 Reno has built a large collection of public art, which includes the most pieces of permanent art that have had a temporary home at the Burning Man event. 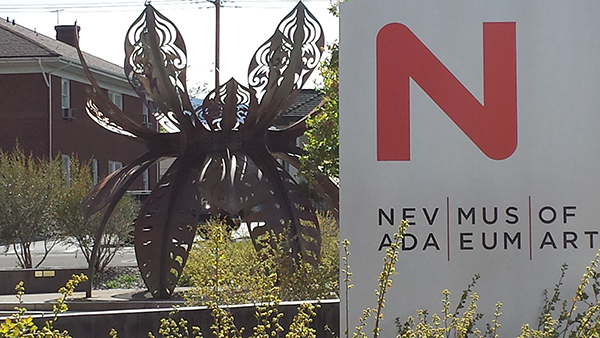 We hope you enjoy touring around Reno and experiencing these large-scale interactive installations. 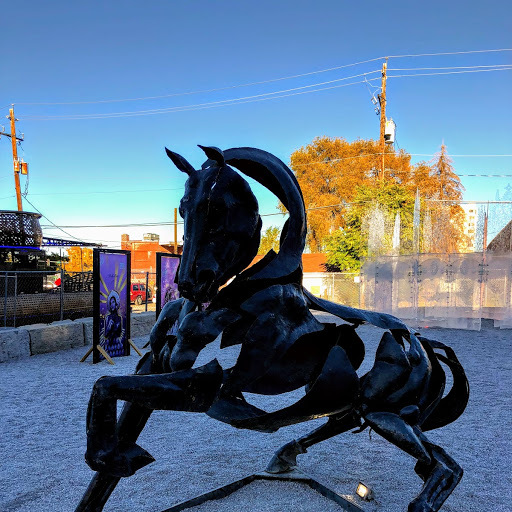 To fully capture the essence of the pieces, we encourage you to get out of your car and spend a few minutes with each sculpture. To find a sculpture: Sculptures are represented on the map by the icons. Clicking on these icons brings up information about each mural and where to find it. To find a specific mural you can do one of two things: 1) zoom in to a location by double clicking on an area or on the zoom icon (a “+” sign in the lower righthand corner of the map) until you find a view that you like, or 2) if you know the name or exact location of a sculpture, you can click on it in the Sculpture Legend located on the left-hand side of the map. To open or hide the sculpture legend: Click on the button in the upper lefthand corner of map (it looks like 3 dots and 3 lines). To hide the Sculpture Legend, click the upwards facing arrow at the very bottom of the Sculpture Legend box. The base of Portal of Evolution is a cocoon-like enclosure, large enough for several people to stand in. Organic, floral shapes sprout from the base, crowned by a massive, delicate butterfly, which revolves slowly in the wind. The artist frequently touches on themes of the forces and wonder of nature, this time illustrating a moment of transformation and actualization. The sculpture invites visitors to participate in a very personal way, by stepping into the base and becoming part of the sculpture. Born in Oakland, Calif. in 1955, and raised in Point Richmond, Calif., Tedrick has always shown an aptitude and interest in building large-scale structures. He received a B.F.A. in Sculpture from the San Francisco Art Institute in 1985. Tedrick now resides and works in his studio in Glen Ellen, California. He and his wife, Terry Roberts, have two children, Nathalie and Jakob. Guardian of Eden frames our current ecological crisis within the petals of the Sacred Lotus flower—the mythological seat of creation and the symbol of enlightenment. As a meditation on our own era of time, this steel lotus flower blooms before us as a physical reflection of the fierceness and beauty of our planet under threat. She is the guardian of the Eden that once was. Kate Raudenbush is a New York-based, Burning Man-bred artist, who resonates deeply with environmental issues, and the perils and potential of our evolving humanity. She is a self-taught sculpture artist who utilizes welded, laser-cut steel, mirror, and light to shape her concepts into climbable, enveloping environments and sacred spaces that invite both intellectual curiosity and visitor exploration. 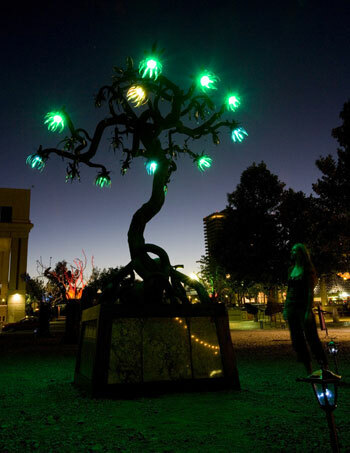 Tree Spire was first funded by Burning Man and exhibited at the event in 2007. Tree Spire was the first project created by the Seattle art collective, the Iron Monkeys. The Iron Monkeys are a Seattle-based metalworking collective, working under the gentle guidance and watchful eye of Tabasco Mills, owner of Seattle’s, The Blacksmith Shop. The collective works together to design and create large-scale sculptural pieces, often combining both functional and decorative elements. Laura Kimpton and Jeff Schomberg have been collaborating on their Monumental Words series at Burning Man since 2009. The word “Believe” is meant to encourage people to have faith in the good. It also inspires belief in the city of Reno. Kimpton is a mixed-media artist, painter and sculptor. She is widely exhibited in museums and galleries across the nation with major shows in New York, San Francisco, Los Angeles and Texas. She lives and works in Sausalito, Calif. Schomberg is a sculptor and installation artist. His unique style incorporates welded steel, stone and found objects. He has exhibited in New York, San Francisco and Nevada. He lives and works in Reno. 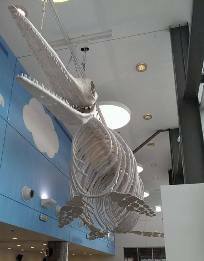 The Ichthyosaur Puppet Project is a full-scale, 50-foot ichthyosaur-skeleton marionette. 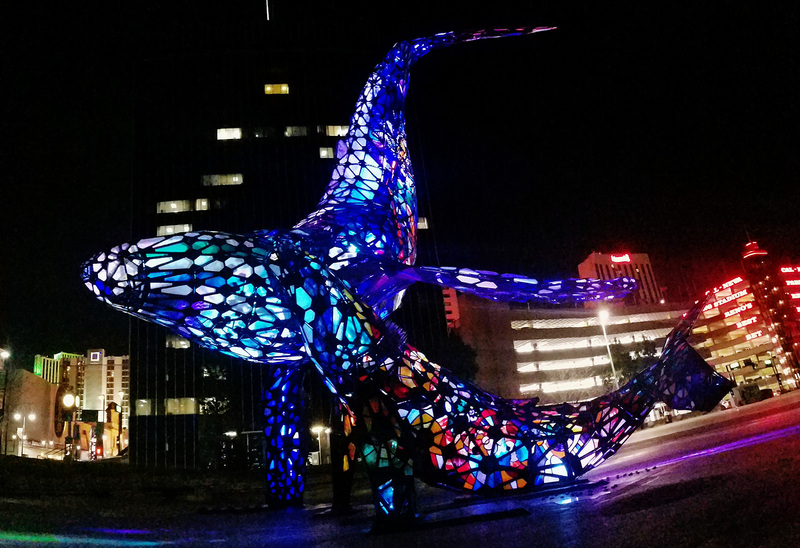 This gigantic fish lizard, which also is called Dr. Camp’s Holy Bones, is part sculpture, part manifestation of a fictional scientific discovery turned religious phenomenon. The puppet is a likeness of Nevada’s state fossil, the ichthyosaur. The marionette, built of plywood vertebrae, was showcased at Burning Man 2013 inside a structure reminiscent of a 19th-century evangelical revival tent. Jerry Snyder is an attorney by day, a notorious bon vivant come nightfall, and an experienced leader of abstractly defined, multi‐faceted adventures. He studied art in college in the early 1990s, then went to law school. He was content with thinking about making art for the better part of two decades. That gave him some time to think through his ideas before making big objects. The Reno Star Cosmic Thistle was made from repurposed, salvaged steel from the dismantled ‘Taba Turbine project.’ The red spines were designed to resemble high desert plants found in the Great Basin region of Northern Nevada.It’s design was inspired by the idea of ripping structural steel box-beams lengthwise and utilizing their inherent internal tension to emulate the natural arcing properties of the high desert plants found in the Great Basin. The Reno Star Cosmic Thistle symbolizes the recycling fertility of the eternal creative spirit. 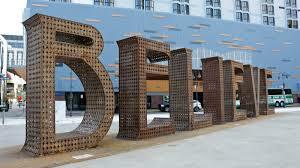 Mark Szulgit is an architect and designer specializing in large sculpture in a variety of media. Mark collaborated for five years with a variety of architectural offices and received his professional SAR membership in 1998. He then moved to Jukkasjärvi to become one of the lead designers at Sweden’s famous Icehotel for a decade 1998 – 2008. His home is in Sebastopol, Calif. 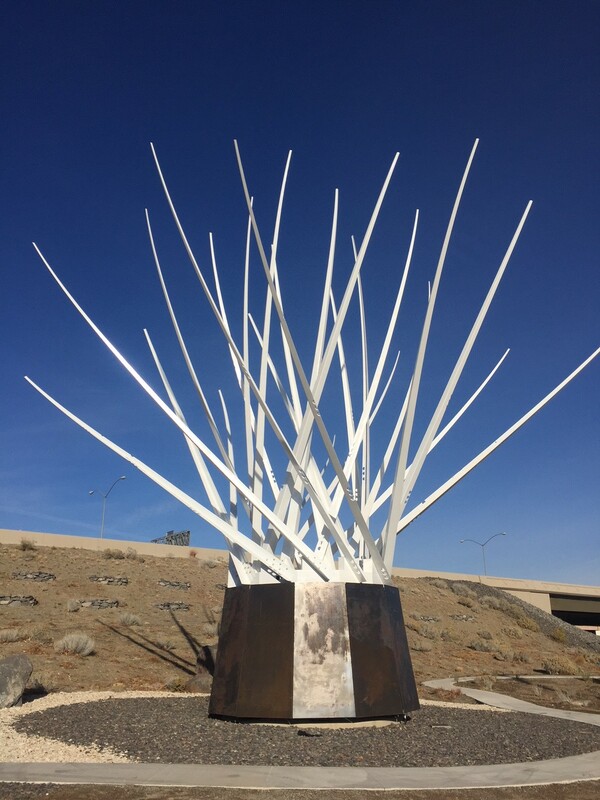 The piece was repainted by the City of Reno to it’s original white in 2017. 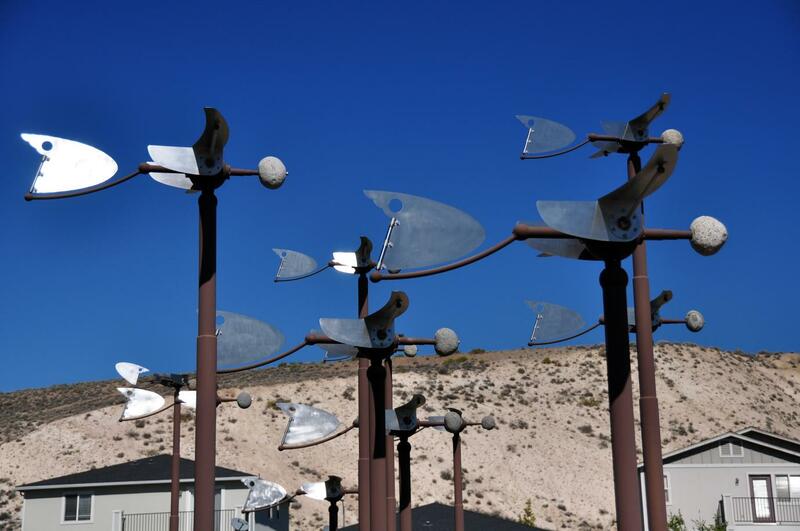 David Boyer is a kinetic wind sculptor known for his large-scale public art projects. 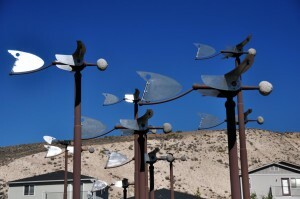 In 2003, he received a commission with the City of Reno to build 63 wind-driven light pole sculptures for their Arts and Culture District in downtown Reno. 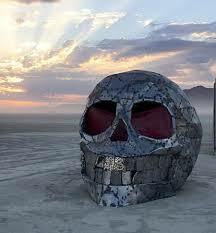 Since 2007, he has been building sculptures for Burning Man. He lives in Reno. Pan’s Perch is a sculpture of a tree bearing fruit, lotus flowers hanging from the branches at various states of opening, and the image of the Celtic Green Man. It is a place of communion and conversation, and provokes contemplation about the loss of such “covent gardens” in the modern world. Ryan Jackson is a steel worker by trade. He finds deep satisfaction in using the waste material from the shops that he works in. Ryan hopes that people see through his work that “scrap” can be made into something beautiful. The use of scrap material is a good part of his ‘mojo’ as an artist. From: Reno, NV – Temporarily placed at City Plaza, 10 N. Virginia St.
About piece: The Space Whale is a full scale 50 ft. stained glass and humpback whale mother and calf. A monumental testament to family, our relationship with nature, time, space and our responsibility to preserve our environment. The Reno Playa Art Park consists of art pieces that were on the playa during Burning Man 2016. 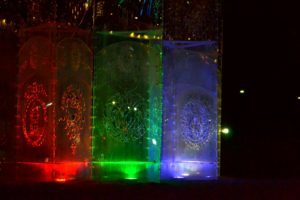 These are smaller interactive sculptures, no taller than 16′ – no larger than a 10’ footprint. First install was in November 2016 at 528 N. Virginia St. Second install was November 2017. 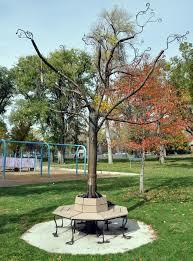 Medium: Forged and fabricated steel and wrought iron. 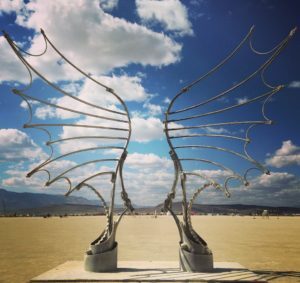 About piece: A sculpture of wings preparing to take flight inspired by the drawings of Leonardo da Vinci created for Burning Man 2016. 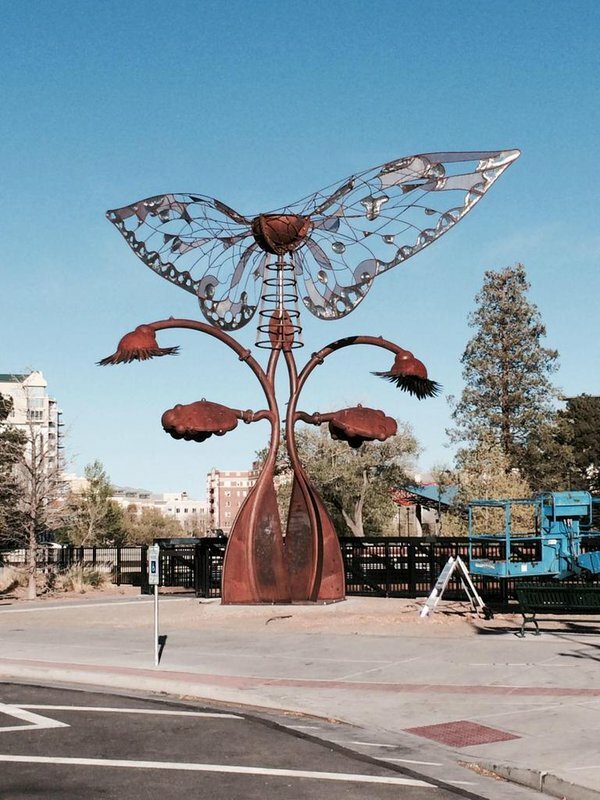 It was designed and built by a small team of blacksmiths from Truckee, Reno, Tasmania and Columbia. 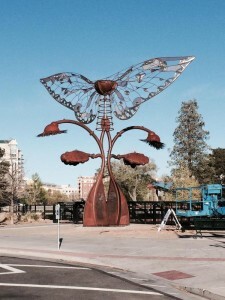 The wings are made of forged and fabricated steel and wrought iron using many traditional blacksmithing techniques and joinery. Although built in a modern day shop, much of the work was done by hand using hammers and anvils. Medium: Mixed Media, wood, steel. About piece: This celestial equine bench was oriented to the rising and setting sun, so citizens of Black Rock City could relax for a moment and take in the beauty of the day. 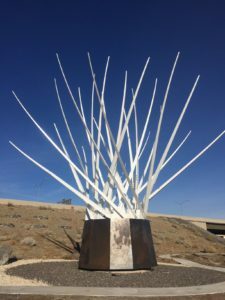 Here in Reno, it encourages interaction between citizens by allowing them to sit, facing each other, yet giving personal space, honoring and renewing the energy and spirit of those who pause to reflect. 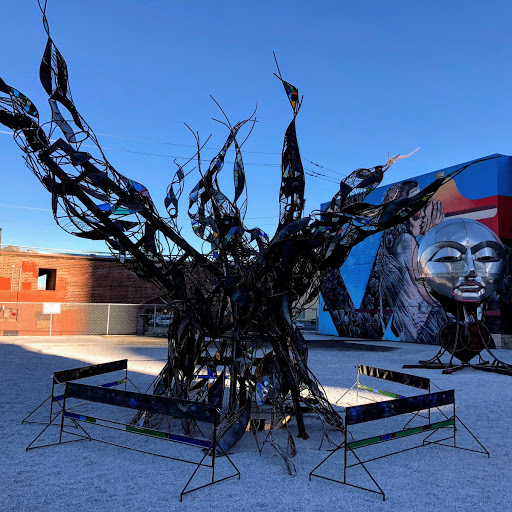 Location: 520 N. Virginia St.
About piece: Lumpy was created for the 2017 Burning Man event by Reno locals. 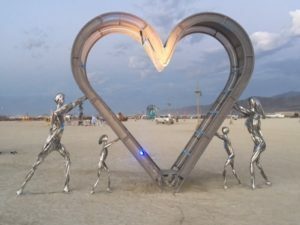 Jeremy and Bill have been involved with more than 40 playa art installations at Burning Man and are part of the team of supervisors that manage the transportation division of the Burning Man Gate, Perimeter and Exodus department. Created at The Generator in Sparks with the help of a few volunteers who are also part of the Gate family. Lumpy was placed next to the driving lanes at the entrance to Black Rock City and was the first piece of Playa art participants saw as they entered the event. Lumpy will return to the playa for the 2018 Burning Man event, this time with flame effects, to take his place as an overseer of the gate. 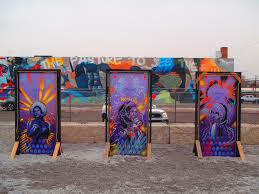 About piece: These 3 doors by artist Bryce Chisholm were commissioned for a 2017 art installation at Burning Man. These are a few of the doors representing addiction recovery form the Sundial to Recovery: The Circle of Addiction. Sponsored by the local nonprofit organization Transforming Youth Recovery. About piece: Trasparenza, Temple of Transparency, celebrates emerging from darkness into light. It is an experiential installation that takes a chapel-like form, that participants can enter and enjoy both inside and out. It is a playful and whimsical tribute to Leonardo da Vinci and the glories of the Italian Renaissance. The sculpture was created for the 2016 Burning Man event whose theme was Da Vinci’s Workshop. The structure is totally transparent, made of clear cast acrylic panels exquisitely laser-cut with intricate imagery. The words ‘SaperVerdere’, meaning ‘knowing how to see’, line the entrance. This was the phrase Leonardo used to describe the dominant skill of his own genius and the transparent installation plays with this notion. At its heart stands a completely see through sculpture, “Vitruvia”, that explores concept of ‘Divine Proportions’ using the body of a woman rather than a man. About piece: Methuselah is a to-scale metal sculpture of one of the world’s oldest trees, a 4,849-year-old Great Basin bristlecone pine located in the White Mountains of Inyo County in eastern California. Ancestry and evolution are central themes for the work. 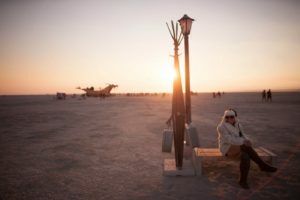 On the playa, the tree’s roots formed organic benches and a flame at the sculpture’s heart was a symbol of permanence and memory. The artists want the sound of the soft chimes from the branches to wreath the space in subtle, wistful sound, reinforcing the visual invitation to remembrance and meditation. About piece: Tonglen is a metal, placid face with calm eyes and pursed lips. Inside the curve of the face is a diamond-shaped combustion chamber and below it is heart-shaped bellows. At Burning Man, a person would use a handle to cause the bellows to expand and contract, forcing air through the combustion chamber and out of the mouth. Tonglen is Tibetan for ‘giving and taking’ and refers to a meditation practice found in Tibetan Buddhism. In the practice, one visualizes taking in the suffering of oneself and of others on the in-breath, and on the out-breath giving recognition and compassion. The practice of Tonglen involves all of the Six Perfections; giving, ethics, patience, joyous effort, concentration, and wisdom. About piece: Landon built Apocalypto in 2011 and it was exhibited at Burning Man in 2018. He grew up riding horses and lives in upstate New York on his father’s horse farm. The artist said he attempts to capture and portrait the wild, beautiful, and powerful energy of horses that he’s gotten to know first hand. About piece: The ten principles of Burning Man are the guiding force behind the Burning Man Culture. 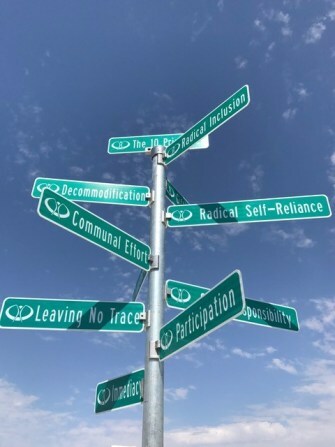 Scott Froschauer’s homage to these principles is a representation of his desire to bring the culture of Burning Man out of Black Rock City and into the rest of the world. Scott’s series of street signs, called The Word on The Street, can be found in front yards, municipal parks, libraries and public spaces around the country. 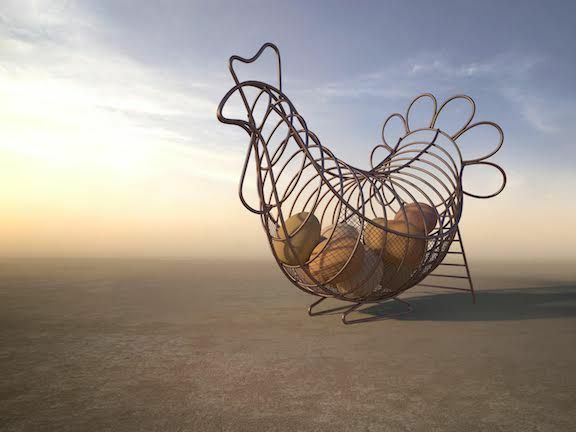 This sculpture, featured at Burning Man 2017, will be traveling to the Smithsonian’s Renwick Gallery in Washington D.C. as part of the No Spectators: The Art of Burning Man exhibit in March 2018. About piece: We use the phrase “It’s a Chicken and Egg Situation,” to describe situations where it is impossible to say which of two things happened first or caused the other to happen. For ancient philosophers the chicken and egg causality dilemma also evoked questions of how life and the universe in general began. This installation takes the traditional riddle and turns it into a giant art object for play and amusement. While the Chicken was on the playa there was a pile of gigantic foam-filled eggs inside which Burners could lie on, and hug, and frolic about. About piece: After attending his second year at Burning Man, Shane found himself contemplating his own identity. Everything he was taught and believed for his whole life was being challenged by what he had seen and experienced. Who am I, started to dominate his thinking. It was at that moment he knew he had to create a piece of art that portrays that very question. The idea was to have a 12’ question mark being held up by a male figure representing himself. The piece was to signify his pushing back on the identity he had formed about himself and the quest to get to know his true self. While building Identity Awareness he met his wife and their marriage added a whole new dynamic to his identity. The following year he added his wife to the art piece and titled if Identity Awareness – Union. With the love and support of his wife, his journey was far from over. 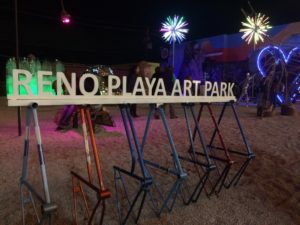 In 2017 they decided to bring their children, Zander (10) and Ella (8) to experience the playa for the first time and wanted to bring art that represented what the family meant. Identity Awareness – Family was Born. The art piece is a large heart being held up on both sides by the family members signifying love and support for each other. About piece: Commissioned for the Playa Art Park. Many Burning Man sculptures have been built here. Also used as a staging area for many Burning Man projects. 34,000 square feet of workspace with industrial equipment and tools. A collective that encourages professional artists and beginners alike to make art and learn from each other as a creative community. It operates under the same creative community ethic outlined in Burning Man’s Ten Principles. Artech is passionate about creativity and innovation. 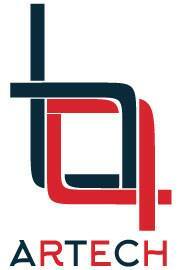 Our goal is to synergize the connection between the arts, technology and education. We do this by being an advocate for creative thinkers and providing a collaborative workspace where they can share ideas and expand the boundaries of their artistic vision.